The Innu were one of the first North American peoples to encounter European explorers, first the Norse, and later the Portuguese, Basques, French, Dutch and British. Even so, they remained much less well known than other aboriginal groups living further west, even though these others were contacted much later. This is partly because the Innu spent most of the year deep in the interior of Quebec-Labrador, where until recently they lived as nomadic hunters, only visiting coastal trading posts for brief periods. They were also one of the last Canadian aboriginal groups to become settled into permanent villages, a process which took place in the 1960s. 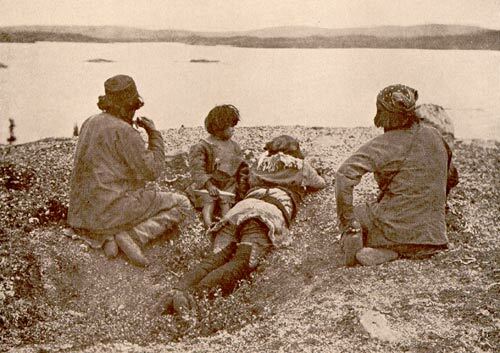 Because for a long time the Innu remained relatively little known to explorers, traders and settlers, a number of historical fables have arisen about them. From Frank G. Speck, Naskapi, (Norman, Oklahoma: University of Oklahoma Press, 1935) 32. One of these fables was that they were recent arrivals to Labrador and Eastern Quebec. Today we know from both historical and archaeological evidence that this idea was mistaken. In the early 18th century a Jesuit priest, Father Laure, had prepared a map which in the 1930s the American anthropologist Frank Speck interpreted as evidence there were no Innu living in the Labrador interior in the 18th century. Speck combined this with the fact that during the 17th and 18th centuries there had been hostile relations between the Iroquois and those Innu living further up the St. Lawrence River. He therefore concluded that attacks by the Iroquois must have driven the Innu eastward into Labrador some time after 1700. However, it has subsequently been shown that, properly interpreted, Laure's map actually confirms the early presence of Innu in the interior of Labrador. Before the 20th century, the Innu were based in the Quebec-Labrador interior for the winter months, but came to the coast in summer, to live off fish, seals, and sea birds. 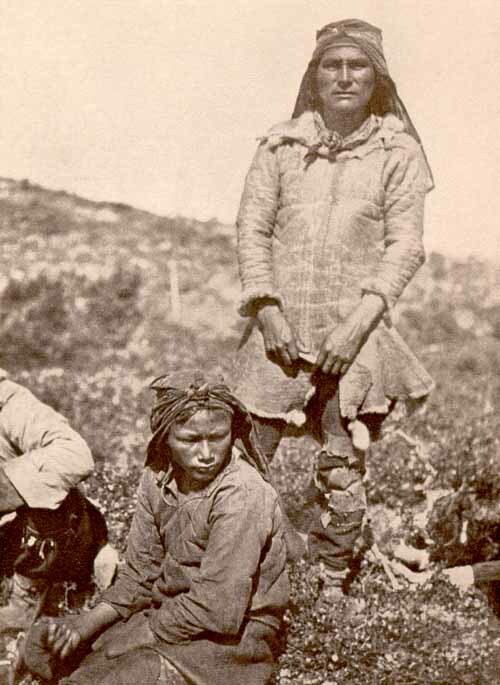 In the 16th and early 17th centuries, the Innu visited the Basque fishermen at their stations in southern Labrador. These summer trips to the coast became more frequent after French traders and missionaries in the 17th century, and British and Moravians in the 18th century, persuaded the Innu to come to their coastal locations. The first sites were established along the north shore of the St. Lawrence, followed by posts at Lake Melville, Ungava Bay and the Atlantic coast of Labrador. Eventually in the 20th century many of these coastal meeting places became year-round Innu villages. From William B. Cabot, In Northern Labrador (London: J. Murray, 1912) frontispiece. 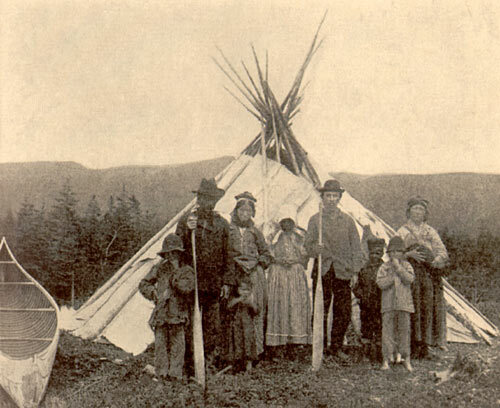 At first, contact with the fur traders and missionaries did not dramatically change the nomadic life of the Innu. In the 19th century, some traders tried to insist that the northern Innu give up caribou hunting altogether in favour of trapping, making them dependent on the trader for their food and supplies. This led to disaster for those Innu who did this. They found themselves without supplies of food or ammunition and many starved to death as a result. However, for most of them, trapping remained a secondary occupation to hunting. The use of guns diminished the need for the earlier large cooperative groups of caribou hunters, groups who previously had constructed fences and corrals where the animals were driven and killed with spears. Following the urging of the missionaries that they make regular visits to receive the sacraments, some Innu found that they had to travel great distances each summer, if the missionaries could not visit each group's locality, as was often the case. However, the most serious disruptions to the hunting way of life of the Innu did not take place until the 20th century. Prior to World War I, fur prices rose, and Settlers (people of part-European, part-Inuit descent, now called the Southern Inuit of NunatuKavut, who had earlier resided on the coast) moved into the Upper Lake Melville region and began to trap along the major river valleys. The Settlers used individually-owned trap lines, and laid down laws of trespass, a system of land use that conflicted with that of the Innu. Soon they had taken over the best parts of former Innu trapping and hunting lands. After 1900, forestry projects also began operations in parts of the Innu area. As the population of major game animals, particularly the caribou, started to decline, Innu began showing up on the coast in a starving condition, seeking assistance from missionaries, traders, nursing stations and the government. From William B. Cabot, In Northern Labrador (London: J. Murray, 1912) 248. By the 1950s the growing dependence of the Innu on government services and social assistance had the effect of restricting them to the vicinity of the villages, with unfortunate results for their society and culture. In the 1960s schools were opened, effectively separating children from parents, preventing children from experiencing the hunting way of life, and further threatening the transmission of Innu language and culture from one generation to the next. The need to send their children to school made it necessary for most parents to stay close to the settlement, but living in a settlement meant that adults could not make a living by hunting and trapping. The result of these changes was that formerly active, proud and independent Innu hunters became partially cut off from the one activity on which their culture placed most value - hunting. They lived in slum housing conditions, and were looked down upon by others as being permanently on government assistance. Excessive drinking, violence, and child neglect followed from the resulting low self-esteem and forced inactivity - results which were to have been expected, given the same kind of transformation that Indians elsewhere in Canada had undergone, after they had been confined on reserves. From the Innu perspective, their settlement into villages seemed to be part of a concerted attempt to separate them from their land, which was at the time becoming transformed for industrial purposes. In the 1950s mines were opened in western Labrador. Restrictive game laws were introduced, which seemed to the Innu to be more for the benefit of the newly-arrived non-Innu sports hunters than themselves. The flooding without warning of vast sections of traditional Innu hunting lands by the Churchill Falls dam in 1969 caused many hunters to lose all their trapping and hunting equipment. After 1980 the increasing use of airspace for deafening low-level military training, placed further strains on relations between the Innu, the government and their non-Innu neighbours. The growing social problems of settlement life led to the formation of Innu political organizations - the Conseil Atikamek Montagnais, in Quebec, and the Naskapi Montagnais Innu Association in Labrador (later to become the Innu Nation) in the early 1970s. These organizations set about improving conditions in the villages, and making it possible for some people to return to hunting and trapping. Hunting and trapping were never entirely abandoned, and today many Innu leave the settlement for long periods in the winter, using modern equipment such as aircraft, snowmobiles, and two-way radios. Improved housing programs are underway. Alcohol abuse programs are running successfully. The Innu have also begun to get involved in the operation of their own schools. The political associations also represent their members, and speak out locally, nationally and from time to time in the international arena. While the associations are partly federally funded, they also work with the provincial governments on such matters as housing policy, health, and education. Elsewhere in Canada these aspects of Indian life come under federal control, but when Newfoundland joined Confederation in 1949 federal jurisdiction was withheld from the indigenous people of the province. One result of this is that the Innu on the Labrador side of the border do not have access to all the same federal programs available to other Canadian Native people. The Innu Nation has a very heavy agenda of work, most of which falls on the shoulders of its leaders. They are involved in land claims negotiations, seeking to continue protecting their land from industrial development such as the Voisey's Bay nickel mine, the Lower Churchill hydroelectric project, the new trans-Labrador highway and forestry projects. At the same time the Innu wish to participate in the development of their traditional lands, providing this can be done in accordance with their own standards and objectives. Utshimassits (Davis Inlet) faced especially difficult social problems, many stemming from having been settled in 1969 in an unsuitable location, with an inadequate water supply, on an island from which access to the mainland for hunting was difficult for several months each year. To address this problem, a federally funded project to relocate the community to the mainland was agreed upon, and in 2002 the new community of Natuashish was established. Updated March 2016. The designation Inuit-Metis, in this article, updated to Southern Inuit, May 2016. For other related articles view the Innu section of the Aboriginal Peoples Table of Contents.